The legacy of the Second World War remains unsettled; no consensus has been achieved about its meaning and its lasting impact. This is pre-eminently the case in France, where the experience of defeat and occupation created the grounds for a deeply ambiguous mixture of resistance and collaboration, pride and humiliation, heroism and abjection, which writers and politicians have been trying to disentangle ever since. 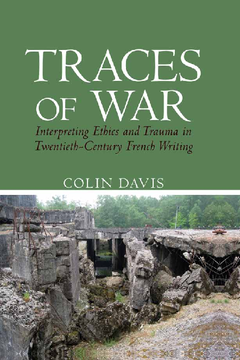 This book develops a theoretical approach which draws on trauma studies and hermeneutics; and it then focuses on some of the intellectuals who lived through the war and on how their experience and troubled memories of it continue to echo through their later writing, even and especially when it is not the explicit topic. This was an astonishing generation of writers who would go on to play a pivotal role on a global scale in post-war aesthetic and philosophical endeavours. The book proposes close readings of works by some of the most brilliant amongst them: Jean-Paul Sartre, Simone de Beauvoir, Albert Camus, Charlotte Delbo, Paul Ricoeur, Emmanuel Levinas, Louis Althusser, Jorge Semprun, Elie Wiesel, and Sarah Kofman. 3. Sartre and Beauvoir: A Very Gentle Occupation? Conclusion: Whose War, Which War?